Is It Good? Captain Britain and the Mighty Defenders #1 Review – AiPT! 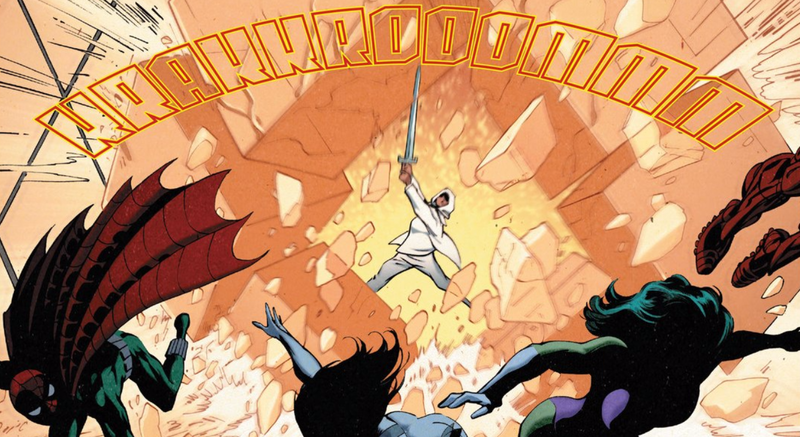 Al Ewing takes his talents to Battleworld and brings readers a reworking of paradise as Ho Yinsen and his Mighty Defenders begin to notice the cracks in Doom’s perfect world. And while their domain is perfect, their plan for rebellion must stand up to a simple question: is it good? Operating both as a Secret Wars tie-in and a remix of Captain America and the Mighty Avengers, Al Ewing’s Captain Britain and the Mighty Defenders #1 is a stellar start to this two-part miniseries. The issue opens on a scene that will be familiar both to longtime comic book readers and newcomers that were entertained by 2008’s Iron Man. Having built a suit of armor, Tony Stark places his fellow captive Ho Yinsen inside the protective suit before telling him to leave. It’s a touching reversal of what readers know, and it sets the stage for the tone of the rest of the issue. Writer Al Ewing recognizes some of the advantages of Secret Wars‘ premise, and utilizes them to humorous effect. Each of the members of his cast is a familiar face, with many characters making a much needed return to the limelight. Ewing also uses some meta-humor for his Mighty Avengers readers (Hobie Brown is Spider Hero, with no hyphen, making fun of Blade’s alias in that title). The plot here is fairly straight forward: Baron Ho Yinsen has begun to have dreams that feel like memories, and this has caused him to question Doom’s omnipotence. His friend She-Hulk, who also serves as this domain’s Thor (wait till you see her hammer), warns him against such heretical thought, reminding him that Doom could tear down the utopia that they have built in this part of Battleworld. But when she and other members of the Mighty Avengers are confronted by a foreigner who is able to cross the borders of domains uninhibited, she begins to question herself. And it is this questioning that leads to Doom’s punishment. Separated by only a wall made by Doom himself, the paradise neighbors a world at war with itself. As punishment, Doom tears down the wall, forcing the Mighty Defenders to live up to their name. Oh, I see what you did there. Also, if you haven’t seen Dredd with Karl Urban you should go do that. The reveal of this other world reveals Al Ewing’s main hook to the miniseries. The neighboring domain is a Judge Dredd parody. Boss Cage serves as the analogue for Dredd, and readers of 2000 AD will notice the similarities, not just in the characters, but in the way Ewing captures the descriptions of the weaponry and the use of captions. It’s a nice touch that adds another level of entertainment to the proceedings. The one major fault of Captain Britain and the Mighty Defenders #1 is the pacing. Al Ewing delves into the backgrounds of several of his cast members via flashback, and while these scenes provide the reader with much needed information, some seem to go on just a panel too long. Normally, this wouldn’t be noticed, but in a two issue miniseries, every panel counts, and it would have been nice to get to the conflict between the two domains a page or two earlier. Illustrating the issue is Alan Davis, joined by inker Mark Farmer and colorist Wil Quintana. The linework by Davis is a more classic superhero style as opposed to more modern style choices influenced by manga and/or pop art. This gives the book an atmosphere that blends the adventurous fun of the superhero genre with the darker tones of 2000 AD that the issue is drawing from. Mark Farmer’s inks add to this, with heavy shadows that make everything feel more claustrophobic, emphasizing the isolation of the domains from one another. Finally, Quintana’s colors do a nice job of contrasting the warmth of the utopian Yinsen city with the harsh dystopia of Mondo City. Is it worse to be bossed or to be judged? Captain Britain and the Mighty Defenders #1 is an entertaining debut that hits most of the marks perfectly. Al Ewing’s characters blend nicely with Alan Davis’ artwork and the use of parody and meta-humor help the creators take full advantage of the Battleworld premise. It remains to be seen however, if the late start to the conflict will be a detriment to the series or if the second issue can close strong.